Its Swing-Away Design Makes Garment Printing Easy. The Insta 228 Manual Swing-Away machine has proven to be a true customer favorite. When disengaged, the Insta 228’s upper platen swings almost a full 180˚ to the right - leaving the lower platen completely free from constraints. Load your garments and place your transfers with ease thanks to the unobstructed access to the exposed lower platen that this press provides you. 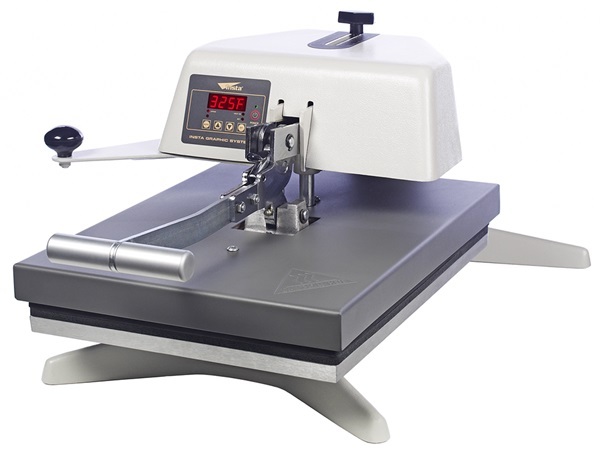 Our manual heat press machine allows you to use your personal professional touch and instincts on every product you make. Many facilities prefer the Insta 228 and use it as a commercial heat press for making large quantities of garments without sacrificing quality. Uncomplicated Operation. Reliable Results. Every Time. The Insta 228 has been strategically designed to generate and evenly distribute tremendous pressure throughout the entire platen. And, its cast-in tubular heating element heats the metal from within, which produces constant and long lasting heat. A successful heat transfer application requires 3 key elements to work in tandem - time, temperature and pressure. The Insta 228 has mastered those elements and gets the job done every time. Power your new business with an Insta! 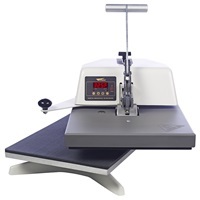 Swing-Away Design Its swing-away design makes this an extremely user-friendly machine by giving you completely unobstructed access to the lower platen while you work. Loading garments and placing transfers is hassle-free. Interchangeable Lower Platens The Insta 228 uses a simple pin system which allows you to easily change out the lower platen and drop in smaller accessory platens for printing on pockets, sleeves, pant legs, back neck and much more. Interchangeable lower platens provide you with tremendous printing versatility, all in one machine. Over the Center Pressure Distribution The Insta 228’s pressure source is strategically placed over the center of its upper platen and uses struts to drive that pressure out to all corners. The result is an even and heavy duty distribution of pressure that is unmatched by other heat presses in the market today. Cast-In Tubular Heating Element The tubular heating element is cast into the aluminum upper platen, heating the metal from within. The element is coiled throughout the upper platen to provide a reliable and even circulation of heat out to all corners. Cast Aluminum Assembly Machines made from cast metal are considered to be the highest quality and are strong enough to withstand heavy use without warping or bending. The 228 is extremely durable and, if cared for properly, can last up to 25 years. Swing away upper platen for clear and unobstructed view of the lower platen. Integrated controller for time and temperature. Interchangeable lower platens for printing in difficult areas. 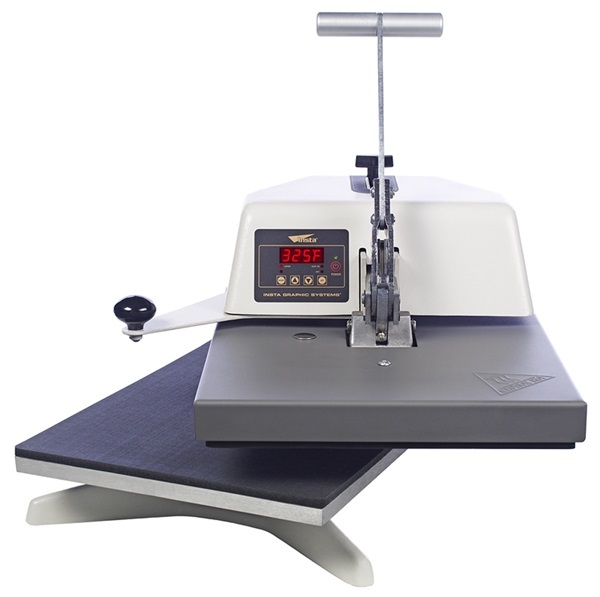 Pressure slide scale for ease of reading pressure. Auto on/off and sleep mode settings. Cast-in tubular heating elements for reliable even-heating source. Platens are cast-heat treated in heat treated aluminum castings for strength and durability. Die-cast bases, arms and housings for machinery longevity. Superior silicone rubber pads for perfect applications.